The whale shark (Rhincodon typus), is a slow filter feeding (animals that feed by straining suspended matter and food particles from water) shark that is the largest living fish species, reaching up to 18 metres in length. Whale sharks are rare throughout Galapagos and mainly found in open water. They are grey-brown in colour fading to paler undersides and have a white spotted pattern. As a filter feeder, it has a spacious mouth which can be up to 1.5 metres (4.9 feet) wide and can contain between 300 – 350 rows of tiny teeth. It has five large pairs of gills. 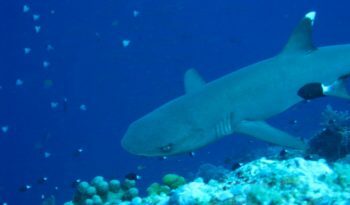 Two small eyes are located towards the front of the sharks wide, flat head. The Whale sharks skin can be up to 10 centimetres (3.9 inches) thick. 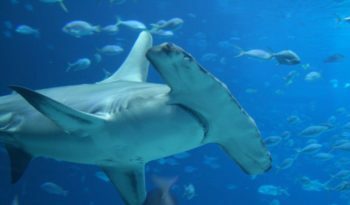 The shark has a pair each of dorsal fins and pectoral fins. 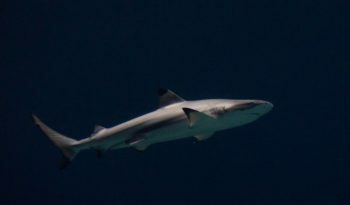 A juvenile whale sharks tail has a larger upper fin than lower fin while the adult tail becomes semi-lunate (or crescent-shaped). The whale sharks spiracles (mall openings on the surface of some animals that usually lead to respiratory systems) are just behind the eyes. The whale shark is not an efficient swimmer since the entire body is used for swimming, which is unusual for fish and contributes to an average speed of only around 5 kilometres per hour (3.1 miles per hour). The whale shark is believed to have originated about 60 million years ago. The name ‘whale shark’ comes from the fishes physiology; that is, a shark as large as a whale that shares a similar filter feeder eating mode. The whale shark inhabits the world’s tropical and warm-temperate oceans. 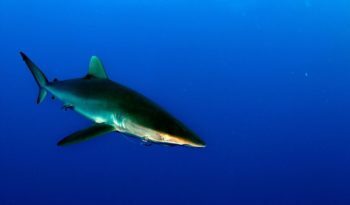 While thought to be primarily pelagic (open sea or ocean that is not near the coast), seasonal feeding aggregations of the sharks occur at several coastal sites such as Galapagos. The whale shark is solitary and rarely seen in groups unless feeding at locations with an abundance of food. Males range over longer distances than females (which appear to favour specific locations). 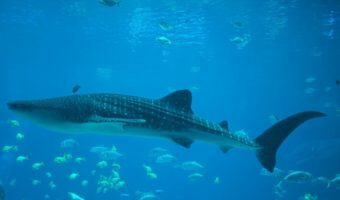 The whale shark, as a filter feeder, are one of only three known filter feeding shark species (along with the basking shark and the megamouth shark). It feeds on phytoplankton, macro-algae, plankton, krill and small nektonic life, such as small squid or vertebrates. The reproductive habits of the whale shark are obscure. It is believed that Whale sharks are oviparous (animals that lay eggs, with little or no other embryonic development within the mother), but the capture of a female in July 1996 which was pregnant with 300 pups indicates that they are ovoviviparous. 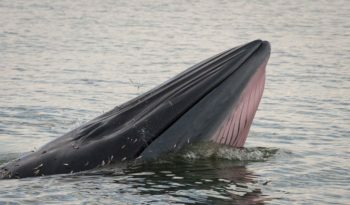 The eggs remain in the body and the females give birth to live young which are 40 centimetres (15.7 inches) to 60 centimetres (23.6 inches) long. 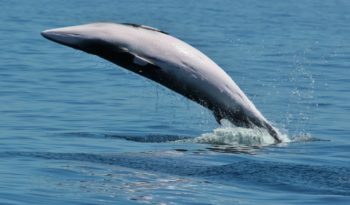 It is believed that they reach sexual maturity at around 30 years and the life span has been estimated to be between 70 and 180 years. The whale shark is targeted by commercial fisheries in several areas where they seasonally aggregate. The population is unknown and the species is considered vulnerable by the IUCN. All fishing, selling, importing and exporting of whale sharks for commercial purposes has been banned in the Philippines in 1998 , followed by Taiwan in May 2007.